The preliminary hearing for Justin Ross Harris, the Georgia man charged with the murder of his 22-month-old son, was streamed live through ABC.com on Thursday, July 3rd. 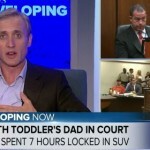 Harris left his young son, Cooper, in a hot car for 7 hours which resulted in the toddlers death. Harris claims it was an accident and that he forgot to drop the child off at daycare on his way to work. Prosecutors are alleging that this was not, in fact, an accident and that Harris purposefully left Cooper in the car. During the preliminary hearing, a detective from Cobb County Georgia, who was first on the scene, revealed some startling details that suggested Harris might not be completely innocent. Based on this evidence Harris was denied bond and is currently in prison facing child cruelty and felony murder charges. Says Dan, “Prosecutors have done something that I think is very smart here, they’ve charged him with the lowest crime of murder in terms of what they have to prove. Effectively they only have to prove that he was criminally negligent and that the child died, in order to convict a felony murder. At this point they’re not charging him with premeditated murder, that could change, but this will allow them to present evidence such that, even if there’s some jurors that have questions about whether it was premeditated, if they can prove everything they laid out in this preliminary hearing, they probably wont’ have a particularly hard time proving, at the least, criminal negligence and therefore murder.” Watch the full clip here.